? Optional : Instruction Board, Foot Plate, Carry Case & Door locking System. 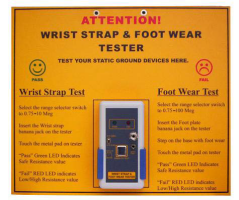 ESD Wrist Strap Foot wear is the first line of defence against electrostatic charges builds up on the human body. It is designed to carry away this charge as soon as it is generated. At the same time Foot wear must remain electrically safe for the user. Thus, it is important to test every Foot wears regularly. In order to protect the sensitive electronic components the maximum Foot wear resistance should not be more than 100 Meg ohms on the other end, the resistance should not be less than 0.75 Meg ohms as protection to the wearer from dangerous level of the voltage and current flow. 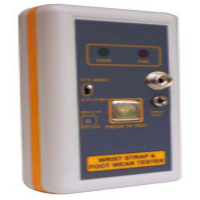 The Foot wear tester checks these parameters under actual operating conditions with the Foot wears. It clearly indicates weather or not the resistance of the Foot wears system including the wearer is at least 0.75 Meg ohms and not more than 100 Meg ohms respectively.